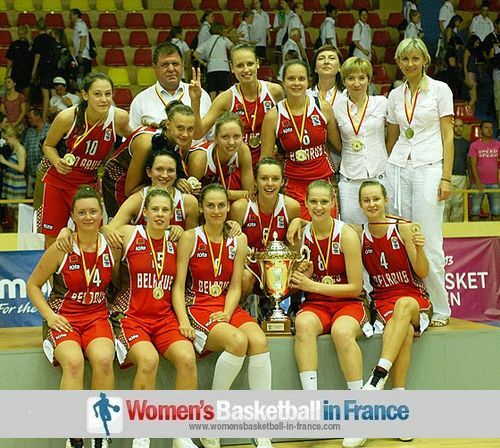 Belarus have won the 2012 FIBA Europe trophy for the U18 European Championship for Women Division B by beating England (76-74) in the final match. Portugal will join Belarus and England in Division A next year after beating Hungary (68-57 in the bronze medal match. Belarus had to dig deep into their reserves to maintain their unbeaten record to claim the Division B title. England had the lead (67-62) with 6:30 to play in the final quarter. But less than two minutes later Belarus were in front after putting together a 7-0 run. Belarus extended their run with a three-ball by Emiliya Kulbitskaya. England tried hard but were unable to get back in front. Hanna Kalenta (12 rebounds) and Maryia Papova both scored 19 points while the leading scorer for England was Shequila Joseph with 22 points. In the third place match Hungary were leading (55-54) with about four minutes to play when Josephine Filipe (19 points) came to life for Portugal. She hit the shot that gave them the lead for good following this up with a couple of free throws. Hungary just managed 2 points down the stretch and thereby allowing Portugal the victory (68-57) and promotion for the first time in this age group. Maria Kostourkova added 16 points and picked up 14 rebounds for Portugal while Amadea Szamosi was the leading player for Hungary with 15 points and 11 rebounds. 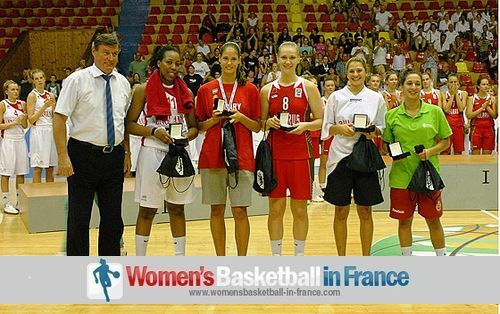 Maryia Papova of Belarus was named the MVP of the U18 European Championship Women Division B in Strumica. She had a consistent tournament to lead Belarus to the gold medal with averages of 14.6 points, 9.7 rebounds, 2.6 blocks and 2.9 assists per game. She was joined in the All Tournament Team by Amadea Szamosi from Hungary, Shequila Joseph from England, Ines Viana from Portugal and tournament top scorer Iva Kostova from Bulgaria. Scotland were the winners of the Fair Play Award. In the final classification games, Bulgaria clinched fifth place with a (79-45) victory over Denmark. Iva Kostova of Bulgaria was on fire, scoring 31 points, collecting 8 rebounds, dishing out 5 assists, coming up with 6 steals and blocking 4 shots. Ieva Kazlauskaite scored 16 points as Lithuania defeated Germany (72-66) in the seventh place match. Latvia finished 9th after an easy win (73-32) against Austria, while Finland edged Ukraine (74-72) to claim 11th place. Israel won the match for 13th place with a (70-52) win over Montenegro. Macedonia defeated Norway to come in 15th and Switzerland prevailed over Scotland (53-46) to end up 17th. March madness means schedule changes, Bourges eliminated from ELW, Villeneuve qualify for ECW final while Calais win a regular season game in the LFB./COB Calais n'est plus la lanterne rouge. Some LFB teams are not so good when their overseas players are injured giving a chance to their opponents to win./Des blessures à ses joueuses clés handicappent des formations. Émilie Gomis is back in the LFB, this time for Toulouse. Arras are the big losers of round 19./Le retour de Miss Go et la malchanche de Arras sont les nouvelles de la 19e journée. In the LFB round 18 accuracy in the shot selection made you win the game. / Une meilleure adresse au tir mène au succès.